Kareem Abdul-Jabbar basketball cards remain as sweet as his legendary sky hook. The Laker center is one of the greatest basketball players of all time making his cards some of the more popular and most valuable basketball cards to collect. You can easily find his cards for sale in many different sports card auctions or eBay. Abdul-Jabbar cards are great because there is such a variety of them. From the tall-boy designs of the late ’60s and early ’70s to the Fleer designs of the late ’80s, there’s something for every collector. We’ve put together a list of the top 17 Kareem Abdul-Jabbar cards that serious collectors should consider adding to their collections. Abdul-Jabbar exploded onto the NBA scene during the 1969-1970 season averaging an incredible 28.8 points and 14.5 rebounds per game. 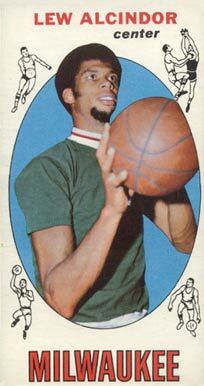 The only recognized Kareem Abdul-Jabbar rookie card in the hobby, the 1969 T﻿﻿op﻿﻿ps #25 issue measures in at an oversized2 ½" by 4 11/16". A large close-up of the young Abdul-Jabbar is shown front and center surrounded by cartoon images of basketball players in each of the four corners. Because of its large size, it can be more susceptible to wear versus more traditional-sized sports cards. Centering and print defects are also common challenges for collectors. 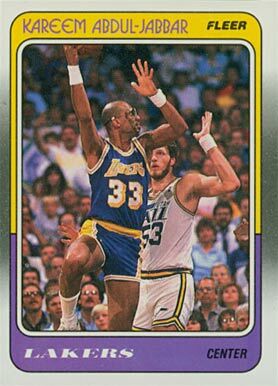 There is little doubt that this is the premier and most valuable Kareem Abdul-Jabbar card to own. Similar to Jabbar’s rookie card, this card presents the legendary center in his green Bucks warm-up shirt in a Tall Boy design. The large pop-out of the basketball in the lower right corner with his name, position, and team provide a nice touch to the overall design. Wear and tear are once again a bit more common with this issue than most due to its large size. This issue is less difficult to uncover in top condition than the rookie card so it’s also considerably less expensive to own. Topps came back in 1972 with the red background but the card design offers a bit more creativity overall than the previous year. The diagonally-increasing size of the Bucks lettering across the bottom of the card adds great visual appeal. The Bucks team name is finally visible across the front of Abdul-Jabbar’s jersey, too. Abdul-Jabbar is shown hunched over and dribbling the ball. The 1973-74 Topps set of 264 standard-size cards contains NBA players on cards numbered 1 to 176 and ABA players on cards numbered 177 to 264. Cards were issued in 10-card packs with 24 packs per box. All-Star selections (first and second team) for both leagues are noted on the respective player's regular cards. Abdul-Jabbar's first team NBA All-Star selection is shown across the bottom. Collectors also get a great action scene of Abdul-Jabbar matching up against Wilt Chamberlain. 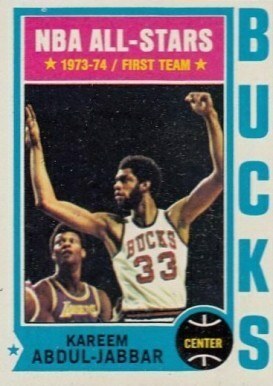 Topps also added a nice pop-out headshot of Abdul-Jabbar in the mid-right section of the card. This standard-sized(2-1/2" by 3-1/2") Kareem-Abdul Jabbar card is the first card in the 1974 Topps Basketball set. The wear and tear it suffered being on top of collector piles makes it more difficult to find in pristine grade. You'll frequently also see a bit of print snow on the black photo background, too. Centering can also be a common issue. 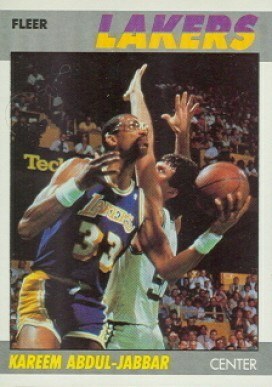 This card is easily one of Abdul-Jabbar's more difficult cards to find in high grade. There has yet to be a PSA 10 and there are just three PSA 9s in circulation. 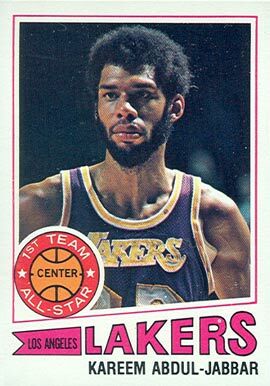 Abdul-Jabbar would appear as a Laker for the first time on a basketball card in the 1975 Topps set. The card design offers a nice full photo view of Abdul-Jabbar. The design seems very simple overall but it still has some nice pop to it. Not as difficult to find in high grade as some of his other cards, it's one of his more affordable by comparison. 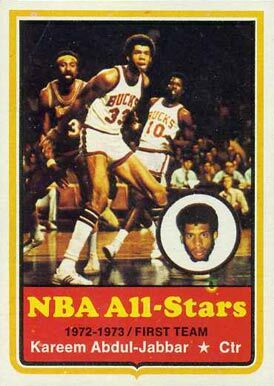 Topps came back with oversized cards once again in its1976-77 basketball card set featured oversized cards once again. Again, that can usually lead to condition and wear issues. The card has great eye appeal with its full headshot of the legendary center. Topps created an interesting concept of a green basketball progressively taking shape as it goes into the hoop on the lower left, too, which adds to the uniqueness of the design. On card #1 of the 1977 Topps set, Abdul-Jabbar is nicely placed front and center with team and position info along the bottom. A bright pop-out on the lower left of the card also shows off Jabbar's status as a 1st team and All-Star member. Just as any other time Abdul-Jabbar appears as the first card in the set, condition issues arising mostly from wear and tear from being the first card can be a challenge. Overall, the look and feel can be a bit plain on this card but it's still a great one to own. The 132-card set that Topps came out with in 1978 had a lot for collectors to take in. Player and team names as well as position info flank the left sides of the cards with large action shots along the right. The pop-out photos in the lower right side are a bit reminiscent of the famous 1963 Topps baseball card design. Abdul-Jabbar is pictured getting ready to bounce pass around Washington Bullet great Wes Unseld. The card isn't as hard to find in high grade as other Abdul-Jabbar cards so it's not among his more valuable. Surprisingly, this is the first Abdul-Jabbar basketball card to show off his legendary sky hook. The exciting action photo gives collectors a great look at the infamous show as he towers over a Washington Bullets defender. It's easy to see on this card exactly why this shot was so tough defend. The card design is pretty good overall offering just the right balance of action and color. Centering is often the biggest condition challenge for this card. The first of a pair of Abdul-Jabbar cards in the 1980 Topps set, #44 shows the big man accompanied by David Thompson and Brian Taylor. The set is infamous for the Larry Bird and Magic Johnson rookie cards but Kareem remained a staple to the set as well. The famous three-card-in-one design is unquestionably the most unique thing about the entire set. Card #132 in the set shows Abdul-Jabbar alongside John Shumate and Larry Demic. You'll notice right away that Topps recycled the same image for this card. There are several other cards in the 1980 Topps set on which Abdul-Jabbar appeared but alongside #44, this one is the other key to making your Abdul-Jabbar collection complete. While not his most expensive or difficult to find in top condition, the 1981 Topps Kareem Abdul-Jabbar basketball card is a great one. The Lakers center is shown in a large full-frontal view atop a dark background which gives this card some punch. A bright pink blowout in the lower left of the card provides the player name, team name and position info. 1981 would mark the last time that Topps would produce basketball cards in the 1980s as they'd take a break until the early '90s. There is little doubt that the 1986 Fleer set is the most popular basketball set ever released. And Abdul-Jabbar has the honor of being card #1. Though it took some extra dings being at the front of sets, this card is still fairly plentiful in top grade. So many collectors are absolutely in love with this set that it seems to keep increasing in price with no end in sight. Abdul-Jabbar is shown posting up on an unlucky defender. The Jordan rookie card is unquestionably the most sought-after card in the set but set builders and Abdul-Jabbar collectors are constantly pursuing this card in high grade. Collectors usually either love or hate the 1987 Fleer design. It can come across as a bit bland with the grey top and bottom borders. Abdul-Jabbar is shown in a nice action shot dipping up and under a defender for the score. Fleer would once again tip their hat to the Lakers center by placing him on their first card in the set. The action shot on this card helps maintain a great overall look even though the grey borders can be a bit of a downer. Last on the list of Kareem Abdul-Jabbar basketball cards is his 1988 Fleer #64 issue. It would be the last major card that he would appear on and it's only fitting that his card run would end with one last look at that legendary sky hook. The 1988 Fleer set has gained in popularity over recent years and there's no doubt the design is sharp. The shift in tones along the borders also give the card a nice touch. While not his most expensive card to find, it remains a key Abdul-Jabbar card to own. Season after season, Abdul-Jabbar terrorized defenders with his unstoppable sky hook on his way to becoming the NBA's all-time leading scorer. As an amateur, Abdul-Jabbar led the UCLA Bruins to an unreal 88-2 record and 3 NCAA Championships. The Bruins, led by the big man, won an unimaginable 72 consecutive games during this run. As a pro, he won six NBA titles as a member of the Milwaukee Bucks and Los Angeles Lakers. 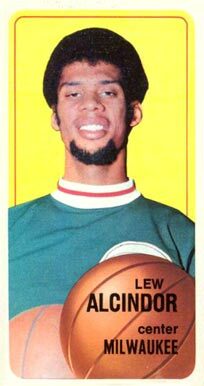 The former NBA Rookie of the Year (1970) won six league MVPs (a record), two NBA Finals MVPs and was named to the All-Star team 19 times. After 20 seasons in the NBA, Jabbar retired in 1989. He was inducted into the Basketball Hall of Fame in 1995. 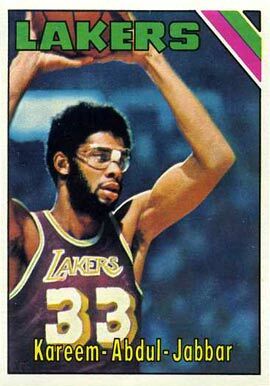 Kareem Abdul-Jabbar basketball cards remain the keys to many sets and are high on many collectors' radars. His cards make the hobby all that more enjoyable and will continue to do so for years to come.